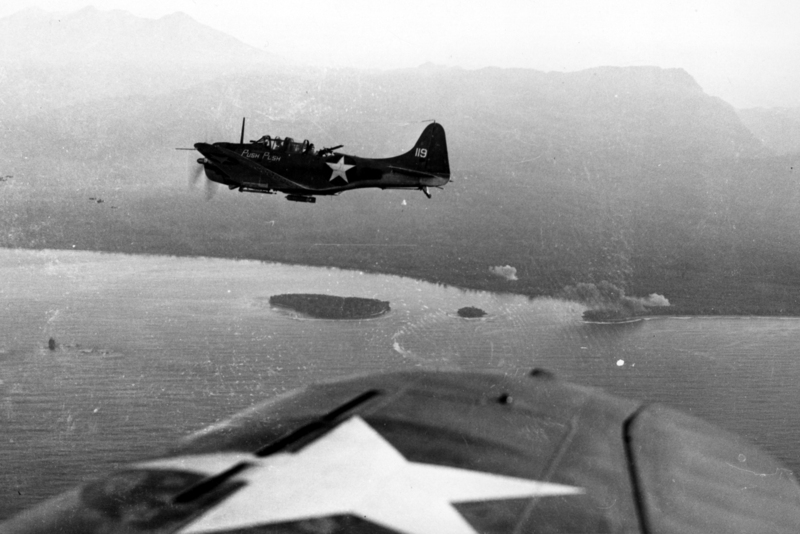 A VMSB-231 SBD over Guadalcanal, late 1942. Frank Christen grew up on a Depression-Era farm just outside of tiny Jerseyville, Illinois, graduating from the high school there in 1938 at age 19. He scraped enough together to continue his education at Washington College in St. Louis, then transferred to the University of Texas at Austin. In June 1941, he enlisted in the USNR and was accepting into the flight training program. 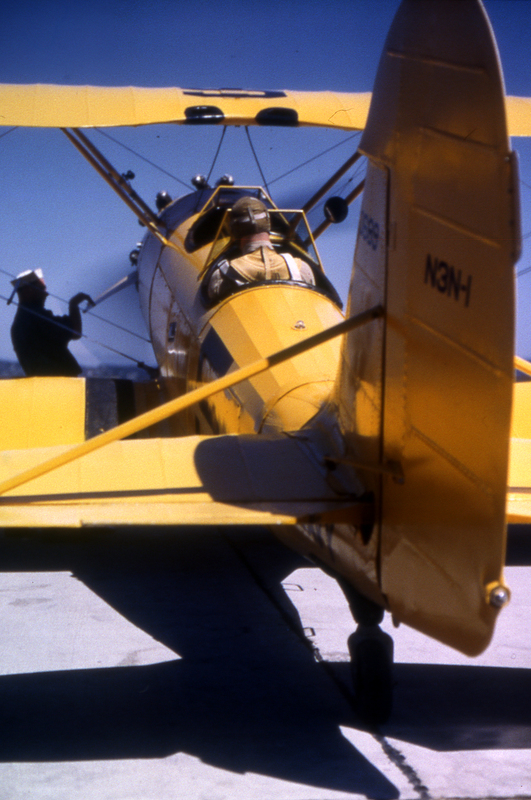 He learned to fly at Grand Prairie, Texas and graduated the following year from NAS Corpus Christi on May 20, 1942. He was commissioned a 2nd Lieutenant in the Marine Corps and assigned to VMSB-142, a Douglas SBD Dauntless dive bombing squadron. While at the University of Texas, Frank had met Ruth Clark of Corning, New York. He and Ruth were married on July 30, 1942 just before he was assigned to NAS Coronado in San Diego. The couple lived together there in Southern California for a brief few months before Frank shipped out to the South Pacific in early November. He reached Guadalcanal several weeks later with VMSB-142 while the fighting in the southern and central Solomons still raged fiercely. He twenty-three years old and flung to the farthest reaches of the planet, far from friends and family. Like the others in his squadron, he did his duty to the utmost. On December 16, 1942, he was ordered to strike targets around Munda, New Georgia. 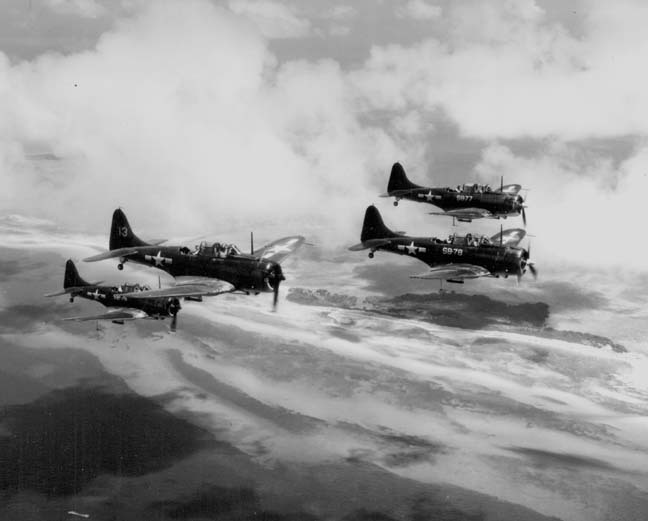 Four SBD’s took off from Henderson Field, Guadalcanal at 2105 hours. This was Christen’s third combat mission in two days. He’d bombed Munda with his squadron the day before, and attacked a Japanese vessel early that day on the 16th. This was a mixed force of Dauntlesses from both VMSB-132 and VMSB-142. During the flight through the growing darkness, the formation ran into a rain storm. Christen and his section leader, Lt. Jackson Simpson, lost the rest of their flight. 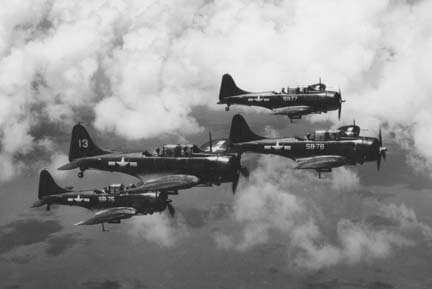 The other two SBD’s continued on and made a night bombing attack on the Japanese-held airfield at Munda. Christen and Simpson discovered a Japanese destroyer in the waters off New Georgia. Christen made the initial run on the destroyer and illuminated it with flares. Fully alerted, the Japanese anti-aircraft crews poured fire up into the night. Simpson rolled in on the ship and scored a direct hit. Christen followed a moment later. That was the last Simpson saw of the Jerseyville native’s SBD. It vanished in the attack. Fourteen days later, a War Department telegram arrived at Ruth Clark’s place in Austin and delivered the news that Frank was missing in action. She packed up and headed straight for Frank’s family in Illinois to await further word. Weeks passed. Nothing. At the end of January, she returned to Austin for the next school term. Months passed without any word. One can only imagine the family’s torment. In August, 1943 Ruth received a letter informing her that Frank had been awarded the Distinguished Flying Cross for his attack on the destroyer that night. After that, there was no further word. in the fall of 1943, Ruth returned to Illinois and spent time with the Christens. Then she went home to Corning to see her own parents. Waiting for her in Texas was a letter from a stranger with an overseas APO address. The day she returned to Austin, she tore it open and read the words every devoted wife longed to read. The letter came from an American serviceman somewhere out in the Pacific who had tuned into a Japanese short wave radio broadcast. The announcer was reading in English the names of Americans captured in the South Pacific. Included in that list was Frank Christen and the Japanese even read out Ruth’s address during the broadcast. Ruth called Frank’s family in Illinois and related the incredible news. Three weeks later, the War Department declared him killed in action. Frank Christen never returned home. His body was never located, and his fate was never learned. There is a plaque honoring him in the MIA section of the American cemetery in Manila, PI. 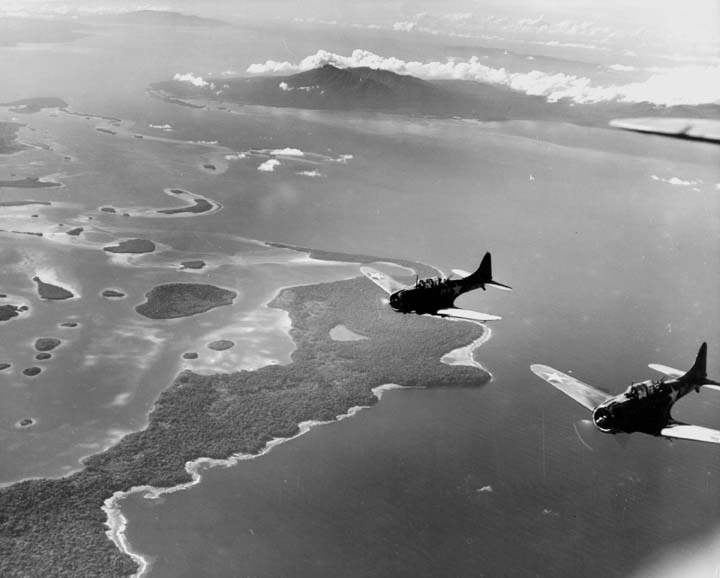 An SBD over Guadalcanal late 1942. Today, I was sitting in a coffee shop in Dallas, Oregon and reading through a pile of documents in hopes of finding another story for this website. I tumbled across a translated Japanese report captured in Manchuria in May 1943. It included Frank Christen’s interrogation report. With considerable help from my Marine Corps historian friend, Mark Flowers, we identified Frank (his name was not included in the document, just his date of birth and educational background) and we were able to find out more about his life and last mission. He’d been shot down during his bomb run over the Japanese destroyer. His SBD crashed into the water and his tail gunner, PFC Glenn Shattuck from Granby, CT, was killed. Though wounded by anti-aircraft shrapnel, Frank got out of the aircraft and discovered the plane’s life raft floating nearby. He inflated it, got in and began rowing toward the nearest island. It was 2300 hours, December 16, 1942. Marine Dauntlesses over the Central Solomons. He paddled ashore and looked for help. Calling out in the night, he failed to find any locals. Concluding that the island was uninhabited, he decided to keep moving. He set out to sea again in his raft, intending to make it to another nearby island. For 18 hours he bobbed in the waves, paddling as his waning strength allowed. Finally, he made it on the afternoon of December 18th. He came ashore and found some coconuts to eat. Not long after, two Japanese soldiers walked out of the jungle and spotted him. They ordered him to surrender, but he bolted and ran. A search ensued. Later that day, the Japanese found Frank high in a large tree next to the island’s jetty. He surrendered and was taken to Rabaul, New Britain and interrogated. Christen was asked about his family–he had five brothers and two sisters–where he attended school, how he joined the Marine Corps and even what he thought of African-American military personnel. The interrogation was thorough and probably brutal. 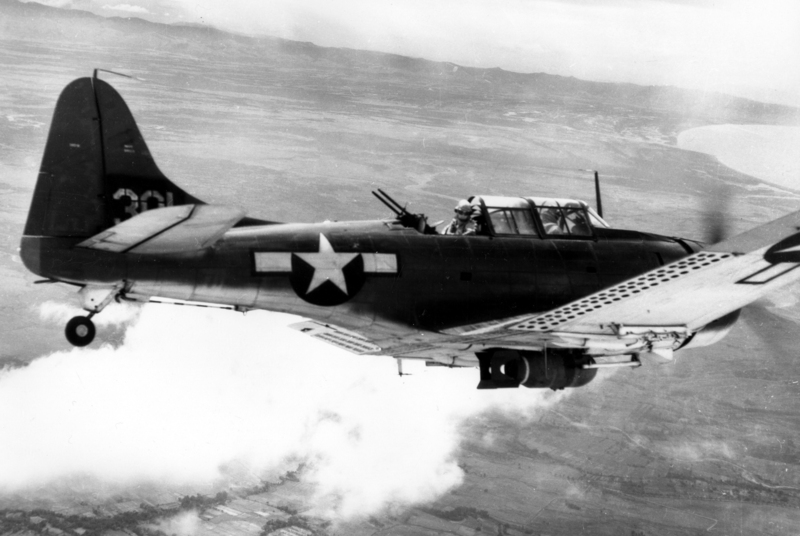 He was asked about the number of aircraft at Guadalcanal, the performance and bomb loads of his SBD Dauntless. He was asked about the resentment between Marines and the Army, and about the morale of the forces on Guadalcanal in general. He answered the questions. At one point, his captors wanted to know what Americans thought of the Japanese. He answered honestly: that he and his comrades had little understand or knowledge of Japan before the war. After Pearl Harbor, they had no doubt the United States would prevail. But then, in the South Pacific, they discovered the true strength of the Japanese. 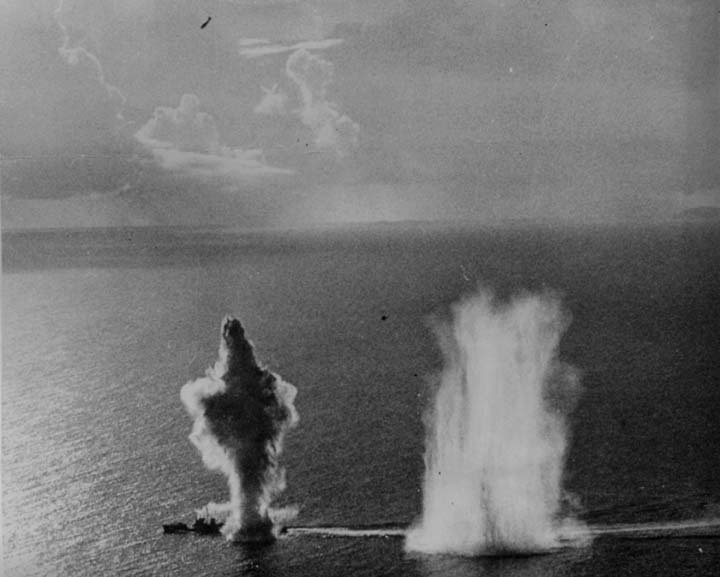 He felt that America had completely underestimated the power and capabilities of the Japanese Navy. 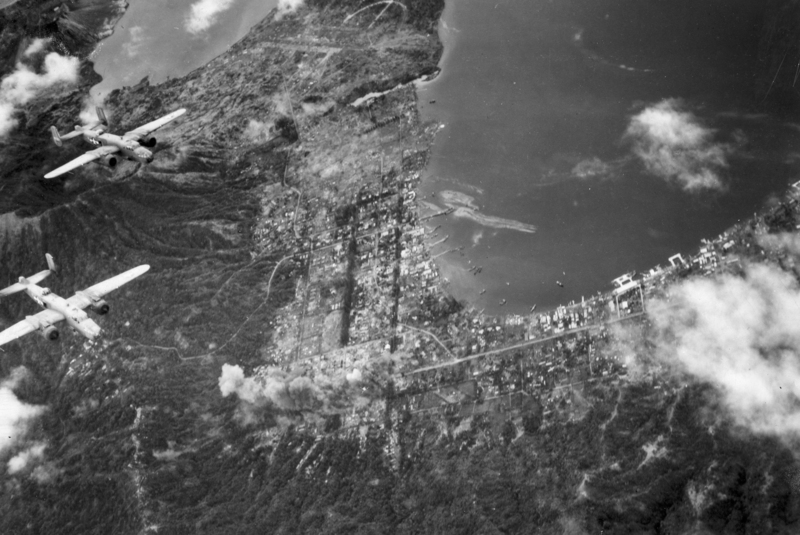 Rabaul under 5th Air Force B-25 attack, March 1944. 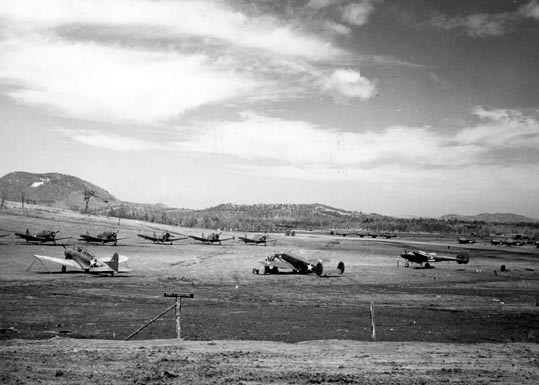 Most of the POW’s at Rabaul did not survive the war. After the pulled all the information they could out of Frank Christen, he asked if he could write a letter home to his wife. His captors agreed and promised him they would deliver it. I read the brief letter today seventy-three years after this scared, traumatized young American wrote it and I wondered if there is still anyone out there who loved him and would want to see it. So, in case there is, here it is. The last letter home of an American doomed to die as a prisoner of war somewhere in the South Pacific. I am writing you a short note to let you know that I am a Prisoner of War. They (The Japanese Army) are hoping that this letter will be able to reach you, and I of course am hoping this reaches you. Please let my mother know as soon as possible. You can send me packages through the International Red Cross. They (The Japanese Army) are very kind to me. You will undoubtedly hear many things, but don’t ever believe them. I was injured by shrapnel but it was mostly a case of fright. I must close now. I love you. I will be able to return when this war is over. My love for you will never change. Please forward this story far and wide. Share it on as many forums and sites you can think of so, if Ruth is still alive, we can get her Frank’s final words.